Squirrel Girl, in her secret identity as Doreen Green, is going grocery shopping and discovers that Tippy-Toe has snuck along inside her bag. We've got a lot of dialogue in panel 1, but it would be relatively small, with the page's focus being panels 2 and 5. 1 - Doreen stands in a grocery store aisle, her cart off to the side slightly. The focus is on her and her bag, as she discovers that Tippy-Toe has come along for the errand. Doreen is not please, grabbing Tippy-Toe (perhaps by the scruff of the neck) and brings her out of the bag entirely. SQUIRREL GIRL: Tippy! We discussed this! Regular, non-superhero people like myself don't go grocery shopping with their squirrel companions! It strains credulity. TIPPY-TOE: Granted, but I needed to stop you from buying all that junky healthy food like fruit, vegetables, and - eugh - seeds. SQUIRREL GIRL: Um, those things are all really good for squirrels? What else would you want? 2 - Tippy-Toe has escaped Doreen's grasp and runs along the shelf. This would be one of those "multiple pose" type deals, as Tippy appears throughout the panel and shelf in front of (or behind, beside, etc) various foodstuffs, calling out their names as she pauses (plus once at the start where she lands). Doreen would watch on from the right-hand side of the panel so that she can comment at the end, a confused look on her face. TIPPY-TOE (1): You know, the good stuff! SQUIRREL GIRL: Conversely, those things are all really bad for squirrels? 3 - Tippy jumps back onto Doreen's forearm (which is maybe being held in a right-angled, "Snow White"-esque manner). Tippy looks accusingly up at her friend, while Doreen smiles down knowingly, pointing at herself with her other hand. TIPPY-TOE: But you eat them all the time! SQUIRREL GIRL: That's because I'm a Squirrel Girl. 4 - Repeat panel. Doreen realizes that Tippy's comment was somewhat insulting and doesn't appreciate it. Tippy doesn't much care and keeps dishing it out. Both are getting rather riled up and are possibly leaning towards one another. SQUIRREL GIRL: And I do not eat them all the time! TIPPY-TOE: That's funny, because that tub of ice cream emptied itself pretty quickly last night! 5 - Pull back to show the grocery store around Doreen and Tippy-Toe. A decent-size group of grocery store patrons has gathered / stopped their shopping all around and are looking on in great confusion. Some have stopped in the middle of grabbing something off the shelf, holding the pose. Others have dropped items in surprise. Some simply cannot look away. Doreen and Tippy-Toe are in a similar pose to last panel, but both have stopped dead, looking at the assembled group in stunned confusion. 6 - A security guard steps up, and while confused, asks them to leave. Doreen and Tippy-Toe look away, embarrassed (Tippy has climbed up to Doreen's shoulder). SECURITY GUARD: I'm gonna have to ask you and your credulous squirrel to leave. Squirrel Girl is pretty much universally loved. If she were a wrestler, Squirrel Girl, aka Doreen Green, would be the ultimate babyface. Some of the cream of Marvel's supervillain crop have jobbed for her in a pretty serious way, with opponent after opponent going down in defeat to her bright-eyed and bushy-tailed ways. Heck, even some of Marvel's premiere heroes have gone down for the count when facing off against her - Deadpool and Wolverine, for example. No one was safe against Doreen Green's popularity. Thankfully for the rest of the Marvel Universe, things eventually settled down and Doreen took on the role of nanny to Luke Cage and Jessica Jones' baby girl. Personally, I always thought this was a suitably adorable role for her to play. That being said, outside forces have happily conspired to launch Squirrel Girl back onto the central stage of public awareness. Ryan North and Erica Henderson were tapped to launch the brand-new Unbeatable Squirrel Girl monthly book. And while we're only 3 issues in, I think it's fair to call the project a resounding success. North has brought his trademark humour and wit and Henderson her superb cartooning abilities to deliver a Squirrel Girl who is all kinds of amazing. Their SG is a very self-aware lady, as she knows she is a fish out of water starting up as a freshman at Empire State University. But she's also rather self-assured, ready for anything, whether it's throwing down with Kraven the Hunter or making new friends on campus. Above all, she - and the book - are all kinds of fun. It's evident that the creative team is having a great time making this book and they want their readership to have the same going through. Thankfully for everyone, that is coming through in a big way. Seriously, I don't know of many more enjoyable books hitting stands at the moment, so I'm rather excited for a week of squirrel-y scripts. Come on and join in if you'd like - you'd be nuts not to. Panel 1. Exterior. The Blue Area of the Moon. BETA RAY BILL and RONAN THE ACCUSER stand facing each other. RONAN: A Korbinite. I had thought your kind extinct, washed away like the useless grime you are. Panel 2. Focus on Bill. BETA RAY BILL: And even with my eyes closed, I would know you as a Kree, for you talk too much and still say nothing of interest. Panel 3. Focus on Ronan. He hefts his hammer and points it at Bill. Panel 4. Bill hefts Stormbreaker and looks at it thoughtfully. BETA RAY BILL: There is an Earth expression that I often ponder. Panel 5. Close up of Bill’s face as he glares at Ronan. BETA RAY BILL: Tell me, “Accuser”, what do you imagine you look like to me right now? Panel 6. Bill and Ronan rush at each other, swinging their hammers in mighty arcs! Panel 1- Foreground, SUE STORM, sits at a table in the middle of one of the big rooms in the Baxter Building, overcome with ennui, cupping her chin in her hand exasperatedly. She is in her classic FF uniform. In the background, REED has his back turned to her as he tinkers with something Kirby-like, while BEN, JOHNNY, and young FRANKLIN and VALERIA kick over a board game as they argue with each other animatedly. Panel 2- Standing in an open window, BETA RAY BILL, looking very Fabio, extends his hand to SUE. His hair is flowing gold, blowing in the breeze, unfettered by his usual helmet. His hammer hangs at his hip, and his cape flies from his shoulders. SUE clasps her hands to her heart in bliss, eyelashes aflutter. BILL: Soft, fair Susan! Never hast thou disappeared from mine eye...or my heart! Panel 3- SUE has torn open BILL's tunic, resting her head against his bare chest. BILL holds her by the small of her back, looking sidelong at something profound in the distance. They stand on a jetty, waves crashing on the rocks as the sun sets. SUE: I cannot stop, desire overwhelms me. But what of Sif, and Reed...? BILL: No matter, fair Susan. All there is, is our passion! Panel 4- cut to the guest suite in Avengers Tower. A TV can be seen as SUE STORM is doing an interview on a talk show. BILL, in full costume, is asleep in a recliner, head back, snoring. SIF is coming up from behind with her shield held above her head with two hands as she's about to blasther him angrily, her teeth gritting in red faced fury. BETA RAY BILL – Of Course Of Course – MK Stangeland Jr.
Panel 1: BETA RAY BILL is attempting to speak to THOR, SIF, and the WARRIORS THREE. He looks a touch distressed. SIF: Something distresses you, mighty warrior Bill? THOR: Tell us what is wrong, Oath Brother! Panel 2: BETA RAY BILL is moving his hands about as he tries to signal what’s wrong. HOGUN: You’re suffering from a terrible disease! FANDRAL: You accidentally wore out your lungs wooing a lady! VOLSTAGG: You’re choking on the bone from a meal! Panel 3: All stop as they hear LOKI from off-panel. LOKI (1): (From Off-Panel) Isn’t it obvious? LOKI (2): (Off-Panel) He’s a little hoarse! Panel 4: All look in the direction of LOKI. He stands with a wicked, mischievous grin on his face as he holds on hand behind his back, hiding something. BETA RAY BILL looks angry, the rest are surprised. Panel 5: BETA RAY BILL angrily flies after LOKI, who is running away at top speed, though he’s laughing his head off all the same. THOR, SIF, and the WARRIORS THREE follow in persuit. SIF: TIS A TERRIBLE JOKE, LOKI! THOR: AYE! AND THAT PUN IS MUCH OF A STRETCH! Labels: Beta Ray Bill, MK Stangeland Jr.
Three rows of panels. Row one is made up of panels 1 through 3, while rows two and three are made up of a single panel each (4 and 5, respectively). 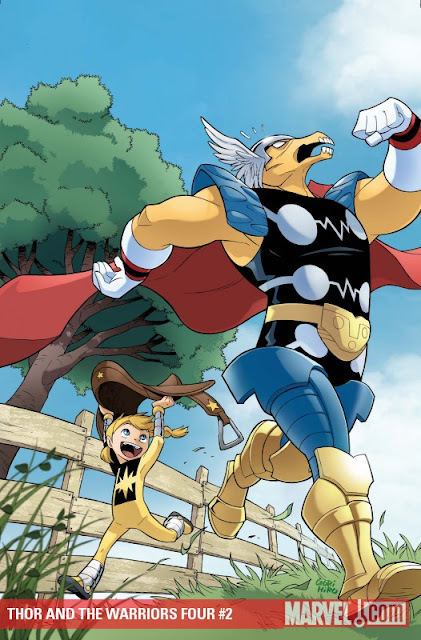 1 - Beta Ray Bill in his pre-Thor armor - the stuff he would have worn just when he got to Earth. He's in what looks like a field, although there isn't much in the way of distinct elements in the background. Bill has one hand to the side of his head, sliding up towards his temple, as if trying to calm his frustration. Facing the reader, he looks off and to the side. BILL: You refuse to give me your full attention. 2 - Bill starts pacing towards the left, hands nervously grasping each other in front of him. 3 - Bill paces back towards the right, both hands up and splayed in evident frustration. BILL: And whenever you finally do, it is always in the negative. 4 - Pull back and switch angles to show that Bill is in a field with a couple of very confused horses. Bill grabs the head of the one nearest him with both hands in desperation and brings his own cranium up close in a futile attempt to emphasize his point. The horse is rather disturbed by this, while the others in the background aren't appreciating it much more. BILL (1): What have I do to offend you so? BILL (2): Why do you insist on ignoring me?! 5 - Switch scenes completely. Bill (now in his regular Thor getup - or if we want to really yuck things up, wearing a traditional professor's jacket complete with suede elbow patches) is standing at a podium, looking out a room filled with aliens who are seated and looking towards him (like a university lecture, perhaps). The aliens can be of all shapes and forms - established Marvel races and brand new ones alike. Behind Bill can be a blackboard (or something similar) that reads "Living on Earth: Important Things to Know". BILL: ...it was near this juncture I began to suspect I may have misread which was the planet's dominant species. Panels 1 and 2 make up row one, panels 3, 4, and 5 make up row two, and panel 6 is row three. 1 - Outside shot of National War Museum in New Orleans, Louisiana. It's a beautiful, sunny day. People are strolling about and enjoying the weather. JAMIE (from within): I can't believe it's actually here. 2 - Inside the museum, two people stand looking at the Haunted Tank, which looks to be the institution's newest display. The two figures are Jamie Stuart, a junior curator of the museum and granddaughter of Jeb Stuart (new character), and Valoric (who goes by Val). If you were already aware of Viking Commando, that's some bonus points to you, but his role here is as an aged curator for the museum (he's old, but not as wizened as he should be due to reasons and Viking magic). VAL: It is certainly an amazing machine. 3 - Jamie turns to Val, a concerned / embarrassed look on her face. Val smiles good-naturedly, happy to grant her request. JAMIE: Um, would you mind if I take a moment alone with it? VAL: I don't see why not. Seems only fitting. 4 - Jamie stands before the tank, her hand on one of the treads. Her eyes are closed. 5 - Jamie opens her eyes and pulls back her hand in (a positive) surprise as a familiar (to the reader) voice comes from off-panel. GENERAL STUART (off-panel): Of course I am! 6 - Pull back to show Jamie looking way surprised by the ghostly appearance of General Jeb Stuart. The General looks the worse for wear, haggard and worn as if he's been up to some ghostly trouble. GENERAL STUART: And I need your help. Continuing the prog-rock-fueled adventures of the Wonder Twins, Zan and Jayna, having narrowly escaped a Thanagarian warcraft. Today's selection is based on "Tarkus" by (again) Emerson Lake & Palmer. Panel 1 - The Haunted Tank is rolling over the snow-dusted Norwegian countryside, away from a decimated village, moving ahead toward the next Nazi stronghold, the Confederate flag flying in the winter wind. (from within the Tank): ...this intel believable, Stuart? Nazi death camps? Panel 2 - JEB STUART opens the hatch and pokes his head out, his breath visible in the winter cold. The ghost of GEN. STUART is foreground, pointing off panel, a look of confusion on his face. JEB: Hey, Slim, why're you stopping? GEN. STUART: What in tarnation...? SLIM (from inside the Tank): You seeing this? Panel 3 - POV from the tank turret. Standing in front of the Tank in the snow, ZAN and JAYNA standing beside the wreckage of their escape craft. They both have a "you gotta be kidding me" type smirk on their face. Panel 4 - Inset, the Twins' fists bump and spark. Panel 5 - largest panel on page. JAYNA, panel left, has changed into a Tarkus, a bone-eating three-story tall red-eyed armadillo made from gleaming living metal and dragon scale, ready to roll on its muscled tank treads (instead of legs), its forearm cannons trained on the Haunted Tank, ready to breathe nuclear fire upon it. ZAN, tiny next to his sister's new form, gestures his arms toward her in a showman's "ta-da". The Tank, panel right, should be backing away almost cartoonishly as JEB slams the hatch shut. The Ghost, and his ghost horse, disappear in a wisp. Because it's a HAUNTED TANK! Hyah! Ride, ya damn yankees! Sgt. Jeb Stuart commands an M3 tank that shares his name, and is haunted by the spirit of the Civil War General the tank is named after. They are part of the mechanical cavalry in the African theatre of WWII, fighting Nazis, ghost planes, and dinosaurs. Yes, this happened. You're welcome. Throughout the strip when it ran in G.I.Combat, the tank would get destroyed, put back together, rehaunted, blown up, replaced by an Abrams, re-rehaunted, and so on. 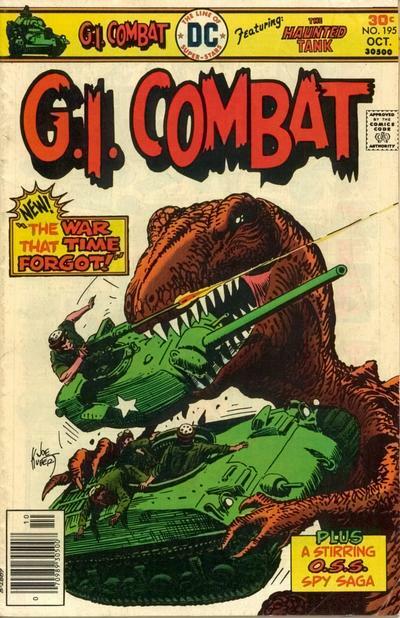 All in all, an off-the-wall concept, but when you consider that the only war comic that ran longer was Sgt. Rock, it obviously had a great deal of distance to go. 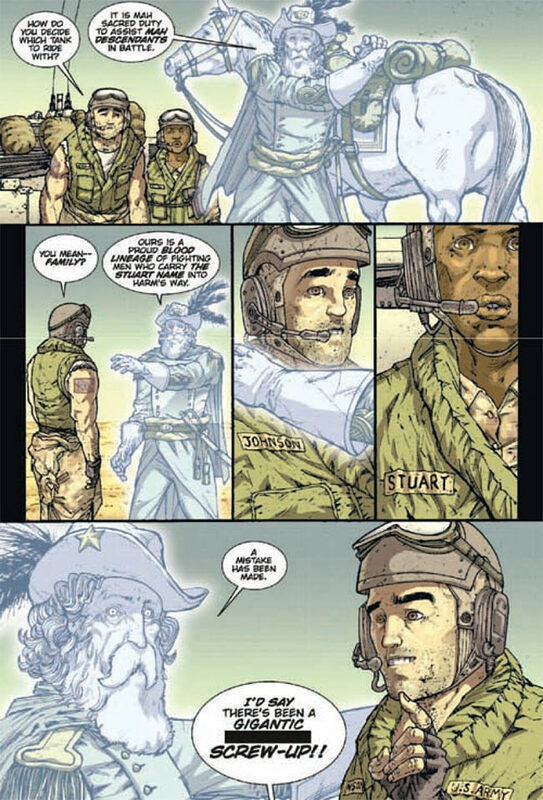 A Vertigo version put the ghost of Gen. Stuart (who commanded the armies of the Rebel South in the American war between the states) in a modern tank patrolling Iraq, and commanded by an African-American also surnamed Stuart, which was an interesting take on today's racial and global politic. 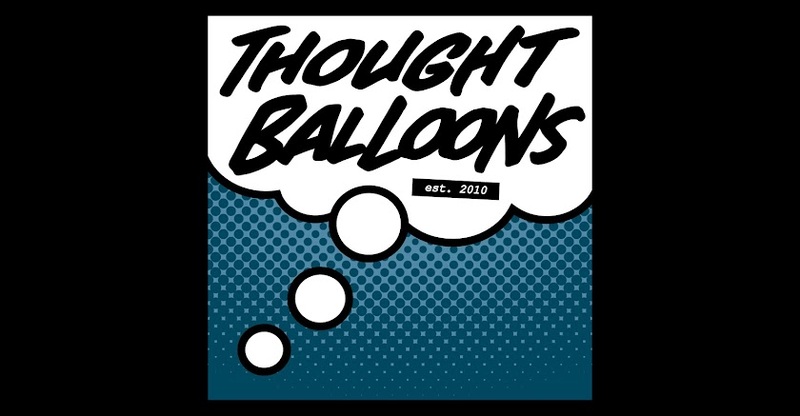 By the way, Thoughtballooners, if you feel like "playing at home", just leave your script in the comments below this post. You can't beat writing about a Haunted Tank! ...unless it's a Haunted Tank fighting a giant Nazi War Wheel! BECAUSE IT'S A HAUNTED TANK!!! Labels: Haunted Tank, R.A. Wonsowski, Why, Why? Panel 1 is big and takes up maybe a little over a third of the page. The rest of the panels focus in on different aspects of the scene set in the first panel. Row two is made up of panels 2 - 4 (all same size) and row three is made up of panels 5 and 6 (6 being maybe twice as wide as 5). 1 - Daisy is at a laundromat, waiting on her washing. She leans against the washing machine, wearing some appropriate "laundry day" attire. There are a number of other patrons throughout the room, a couple folding clothing, some watching their drying, a guy getting a drink from one of the TARGET-Cola machines, and so forth. There's also the old geezer who presumably owns the establishment sitting behind the counter - it looks like he's sleeping in his seat (although hard to tell for sure with his old person sunglasses). CAPTION (DAISY): You pick up a thing or two when you have the world's best spy as your teacher. 2 - Close-up on the couple folding laundry. If you feel the need, their wash could be primarily green, but that isn't important. Maybe coloured so the world around them is a little faded / greyed out to emphasize that they are the focus of the panel. CAPTION (DAISY): For instance, it didn't take long to make these two as Hydra. 3 - Focus on the TARGET Cola machines in the back. While someone stands near them trying to get his cola out (maybe hitting the machine a bit), it's the machines that are coloured, while the rest of the panel is faded / greyed. CAPTION (DAISY): It wasn't hard to recognize these as A.I.M. 's new Death-o-Matic Devices. 4 - Focus on the old (apparently) sleeping geezer. He looks about as dangerous as a tired kitten. As before, the world around should be faded / greyed. CAPTION (DAISY): And although I've yet to figure out who this guy's with, I know that he will be trouble. 5 - Return to Daisy. She's taking out her wash, holding a bright red shirt in her hands. The rest of the world can be regular coloured. CAPTION (DAISY): For all that, we occasionally skipped over some of the more basic stuff. 6 - Daisy's still taking out her laundry - maybe some of it is already in the basket by this point. The important thing is that the rest of the load was white clothing, which has now all been dyed pink. Daisy has a look of annoyance / exasperation on her face. Panel 1: NICK FURY is sitting on a park bench in front of a bush reading a newspaper. An unopened pop can is on the bench next to him. Panel 2: QUAKE pops her head out of the bush. She has a sneaky grin on her face. Panel 3: QUAKE carefully grabs the pop can from where it sits on the park bench. Panel 4: QUAKE holds the pop can in front of her. She has a mischievous grin on her face. She doesn’t look like she’s doing much, but there should be lines of some kind around the pop can to indicate she’s using her powers to shake up the contents of the can. Panel 5: QUAKE carefully tries to set the pop can back down next to NICK FURY. Panel 6: QUAKE stops short as she hears a noise from behind her. Her voice reads of a sudden ‘Uh oh’ as she’s been caught, and she knows it. Panel 7: NICK FURY – the real NICK FURY, as the first one was actually an LMD – stands behind QUAKE, arms crossed in front of him and looking at QUAKE with a face that asks ‘What do you think YOU’RE doing?’, but in a manner that comes with a half-cocked grin. What a difference a year and a half makes. Back when Agents of SHIELD was first rolling, there was a lot of talk about, among other things, how rather lackluster the show was. It wasn’t a terrible show, but it certainly wasn’t what people were hoping for. Then came Captain America: The Winter Soldier, and everything changed for the better. And then, as the show hit its second season mid-year finale, it dropped another couple of bombshells. Turns out that Skye was, in fact, Daisy Johnson, AKA Quake. 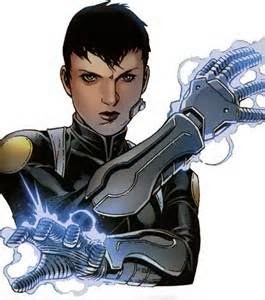 An earthquake generating superhero who served as Nick Fury’s right hand woman during his exile leading up to Secret Invasion and during the Secret Warriors series. A woman who’s got the power to take out Magneto and training from THE spymaster himself to operate on the more clandestine side of the coin. She’s also very much the kind of element fans of the Marvel Cinematic Universe were asking for from Agents of SHIELD from the get go. And if their post-Winter Soldier record is anything to go on, it’s a payoff we can expect to see some great things from. Panel 1: JEN has lead the group to a large tree. JEN (1): Alright, this will do nicely! JEN (2): Let’s cut this tree down and start getting you girls your ‘Lumberjane’ badges. APRIL: Aren’t we a little close to camp? JEN (2): If it hits anything, we’ll use the tree to fix it. JEN (3): In fact, that’s part of the origin of the ‘Lumberjane’ name! RIPLEY: Here I would have guessed it was because of all the manly Lumberjacks going to punch Hitler in the face and women coming in to cut down trees for them. Panel 4: JEN hands RIPLEY a merit badge. Panel 5: RIPLEY takes the badge, but isn’t impressed. JO (2): For coming up with a creative yet plausible backstory. 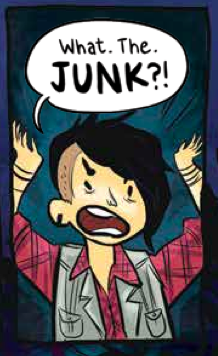 Labels: Lumberjanes, MK Stangeland Jr.
Panel 1- ME, banging my head against the keyboard of my laptop at my dining table; writer's block has struck again. Panel 2- ME, looking up. A knock at my door has gotten my attention. Panel 3- POV over my shoulder. 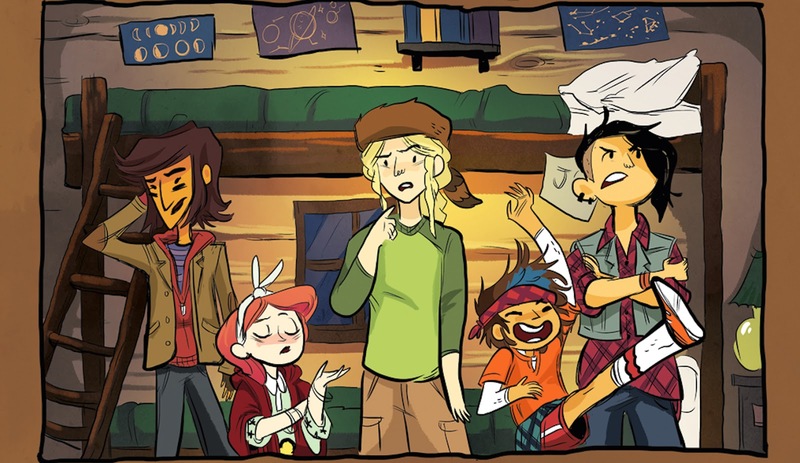 The LUMBERJANES are huddled in one big, hands-folded, pleading mass. Panel 4- Karaoke-pancake night at the Lumberjane's camp (the bedsheets banner behind me says so). I am on stage, scream-singing-rapping into a mike on a boom stand. On one side of me, I'm scratching on a turntable. My other hand is flipping blueberry pancakes in a cast iron skillet over a hot Franklin stove. The 'JANES in the front row scream with glee. Is that a for real question? 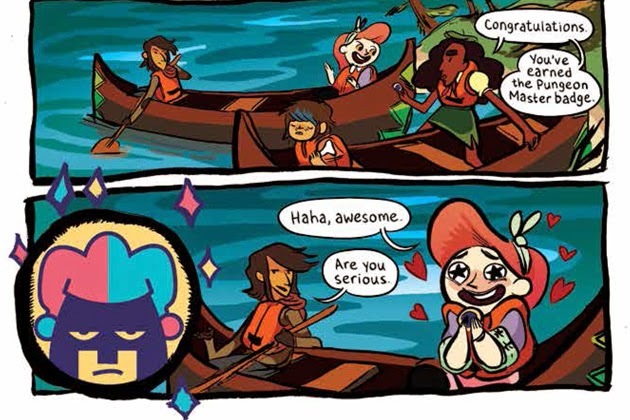 The Lumberjanes burst onto the comic book scene last year, coming out of nowhere to become a mad popular book in what seemed like no time at all. Indeed, it was quickly moved from an 8-issue limited series to an ongoing, and continues to go strong, with its twelfth issue due to hit shelves this month. While its status as a critical darling took some by surprise, it's really not hard to see why it gets so much love. It's a book helmed by some crazy talented female creators that stars an all-female cast that is, above all, extreme amounts of fun. That last one is always important to any book's success, but the first two points obviously deserve some serious attention. For all of the wonderful things that comics do, they still remain something of a boys' club, both when it comes to creators and characters. Admittedly, having an all-female cast is foolishly rare in pretty much all types of media, let alone comics, so that in and of itself is already a cause for celebration. 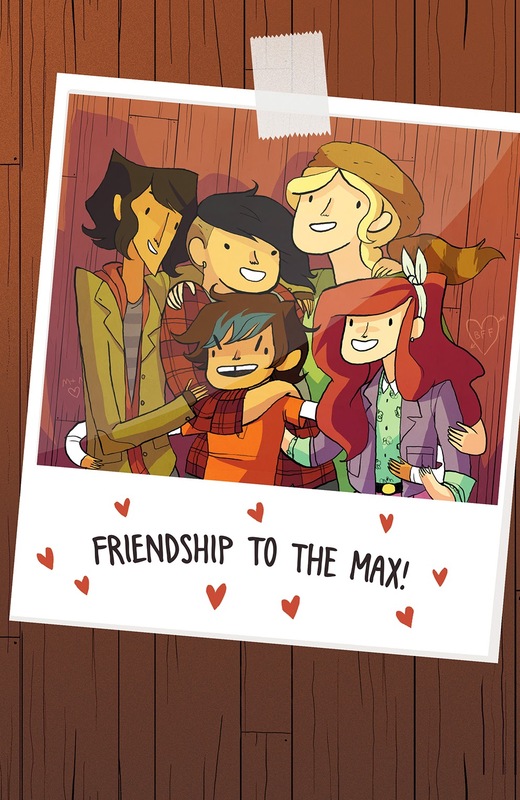 However, Lumberjanes also happens to be adorable, funny, and wickedly clever. So it's like win-win-win. In case you aren't familiar with the concept, it focuses on a group of girls at summer camp that just so happens to be wacky and full of mystical danger. Seriously, they get into all sorts of scrapes, including battling with ancient gods, fighting yeti (yetis? yeties? ), and trying to earn their next merit badge (to name but a few of their many activities). Also, it's all about exploring the true meaning of friendship, which one should always be on board for. There's something for everyone, and with an ensemble cast there's always something new to be discovered, even if its accomplished solely by changing who is interacting with who. Also, there's plenty of puns. 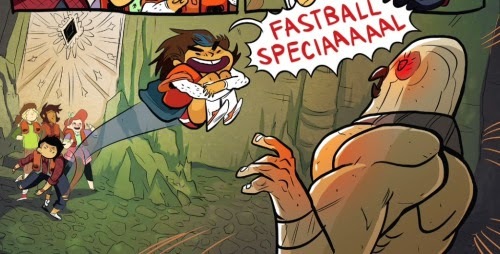 Also also, they do fastball special jokes. So I ardently hope you'll join me in coming up with some exciting new adventures for our daring heroines of derring-do to get up into.